Why should I do that when the Iles froe comes with a very nice beech handle? 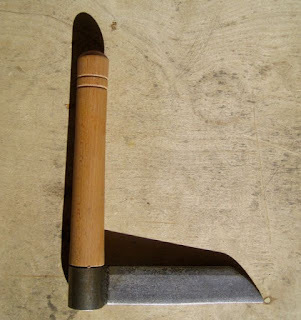 It is my tool and I want a different shaped handle and the handle will do quite well for now. Froes are tools that are very near and dear to my heart. When I was a kid, I helped my parents rive shingles to replace the worn ones on my grandparents' house in the Sierra Nevada of northern California. 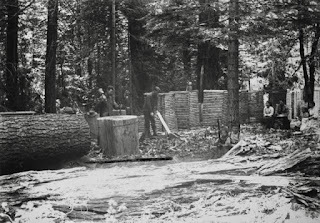 Shingle making had been a cottage industry for many folks that lived in the great forests of Northern California from the 1850's until the end of World War II. My great uncle, Frank, told me that my grandfather, Rufus, could rive one thousand shakes a day, if he didn't have to stack them. During the Great Depression, my grandfather often sold the shakes for a penny a piece. In the above photos are two froes and a shingle bolt marking gauge made by my grandfather. 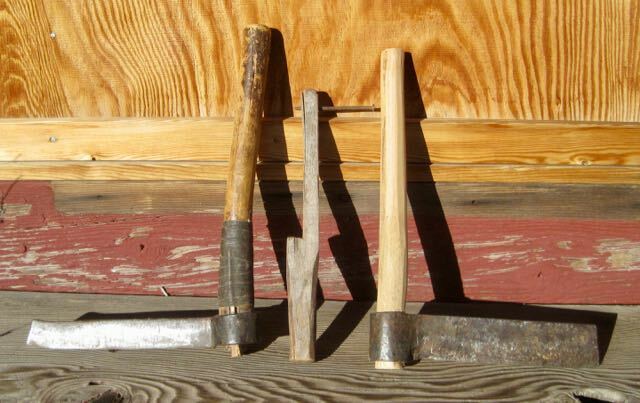 The froe on the right is a "checking" froe; you would mark the top of the bolt with the checking froe to see how many shakes you could rive from the bolt. 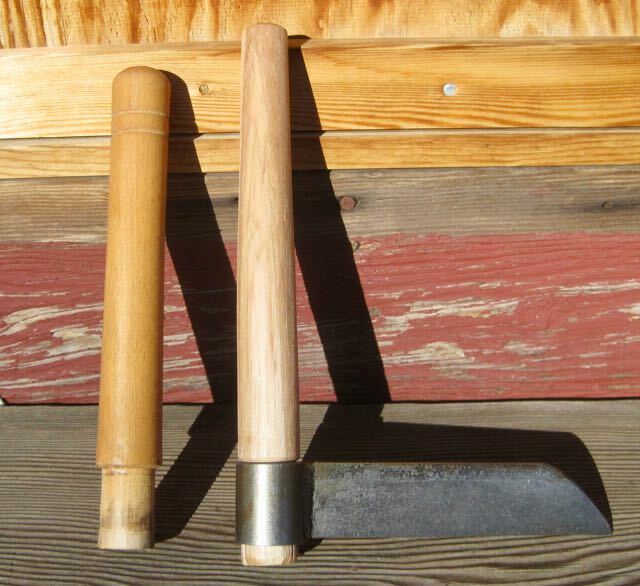 The riving froe, on the left, is what you use to do the actual splitting and riving. Notice how the end of the riving froe is upturned on the very end, I was told this little bend made it easier to get the froe out of the bolt. If I had made my own froe this fall, it would have looked just like this one, only smaller. Notice that the handle on the riving froe has a curve to it, this curve help saves the knuckles of the hand that is hold the froe from getting hit by your froe mallet. California Live oak limbs were harvested for froe handles, they were placed into forms while green to set the curve and were sold once dry. Some where I read that live oak handle sold for as much as 10 cents an inch in 1900. 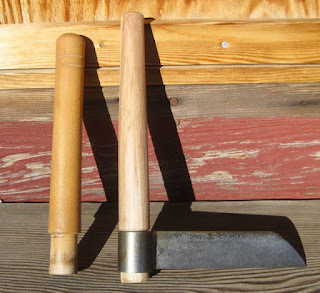 If you want to see how I make a traditional froe mallet, traditional to northeastern California, click here. This historic photo comes from the CSU Chico Digital Collections, click here to see the original photo. These men were working near the Clipper Mills area of Butte County, California. Both men are using froes with French eyes, the gentleman to the left is riving out bolts, the gent on the right is splitting shakes and take a look at the brake he is using. 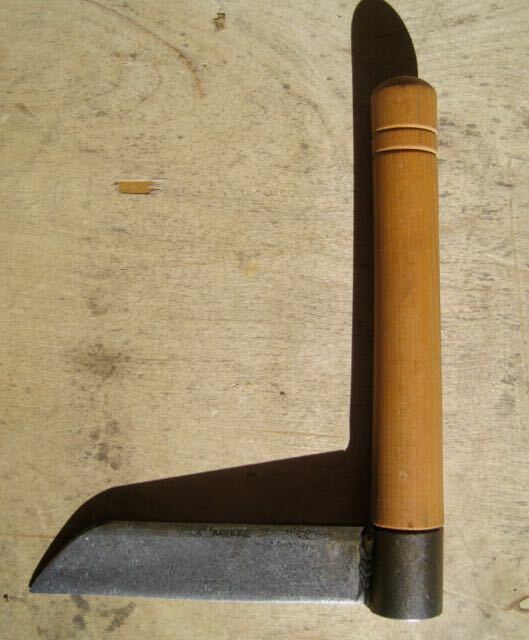 When I was a kid, a similar, but not as fancy, brake that was used by my grandfather was out behind the wood shed. The stacks behind the men are shake bolts, usually six inches wide by thirty six inches long. One implement I don't see in this photo is the baler, a device to squeeze the shakes down so you could wrap them with wire. If I remember correctly, it was 100 shakes to a bundle. 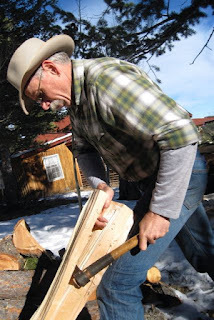 Here's a photo of me, from about five years ago, using my grandfather's froe splitting a cheek for a lathe poppet. As for the Ray Iles froe, it is well made and I look forward to using it, a nice tool to honor a bit of my heritage. All I need to do now is to figure out some sort of board brake to use at the workbench when I split out guitar braces. Congratulations on the new tool and I really enjoyed reading this pots. I've been looking at adding a froe to my toolkit, but know very little about them nor have i ever used one. I'm torn between the Lie-Nielson and the Ray Iles. The plan is to use it to split leg blanks from dry stock for staked furniture. Anyway, enjoyed the post. Hope you enjoy your new froe. What sort of edge is best for a froe? Can you post a picture or two showing yours and how you think it should be? Acute angle? shallow angle? super sharp? I, too, picked up a Ray Iles froe (larger, 8" model because it's my only one so I figured that would be better for a first one) recently and want to prep it before I need to use it. Sorry for the delay in answering your question, Ethan, Blogger has changed their format on me. As to the froe, the one you bought from Ray Iles is top of the line in my opinion. 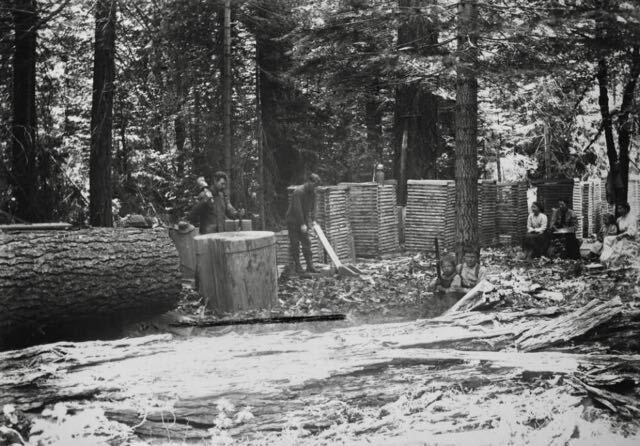 Since you are not riving sugar pine shingles in Northern California for a living, you don't need to get to technical about the shape of the froe. Don't sharpen the edge, just use it. Roy Underhill and Drew Langsner both talk about the froe in their books!